Nobody likes missing out on something big. But if you haven’t started planning your holiday promotions, you’re already late to the party. And with holiday retail sales expected to increase by 4.8 percent in 2018 — to the tune of $720 billion — your business cannot afford to be shortchanged this holiday season. If you’ve been sitting on the sidelines, it’s time to step up with confidence. Create an irresistible holiday promotion and get the word out with a professional holiday email template. 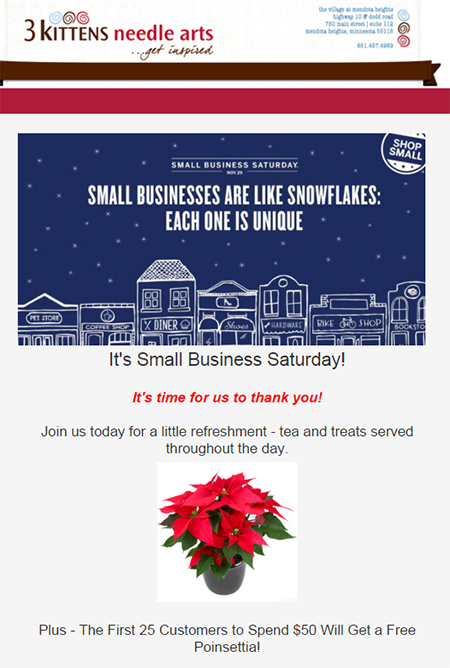 Try out Constant Contact’s holiday email templates for free! Sign up for a free 60-day trial. 3 Kittens Needle Arts encourages customers to come out and shop with them this Holiday season. In addition to serving tea and treats, the yarn store holds a special poinsettia giveaway for the first 25 customers who spend $50 or more. Help your customers find the perfect gift with a holiday gift guide. Include a variety of ideas for different family members and price points. 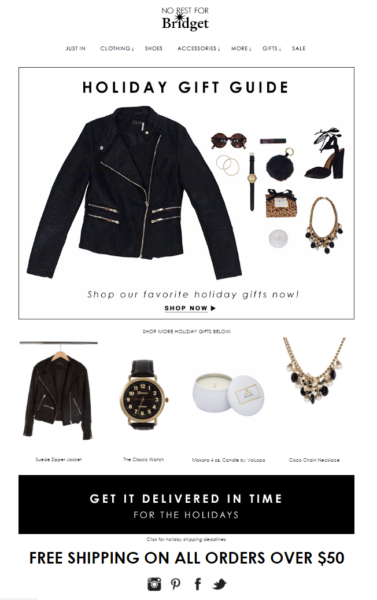 Fashion retailer, No Rest for Bridget, includes a variety of gift ideas in their holiday email — from jackets to shoes to jewelry. 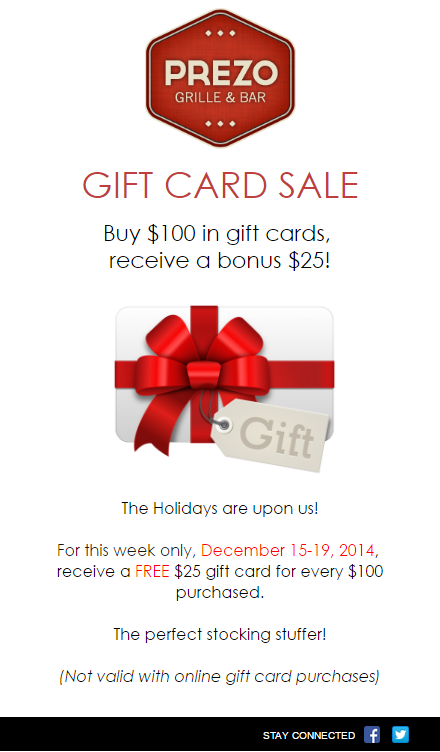 Entice customers to buy gift cards from your business by offering a special bonus. Prezo Grille & Bar rewards customers who buy gift cards by offering a bonus $25 for every $100 spent. This provides the perfect win-win for shoppers who want to give and receive! Drive orders on by offering free shipping. 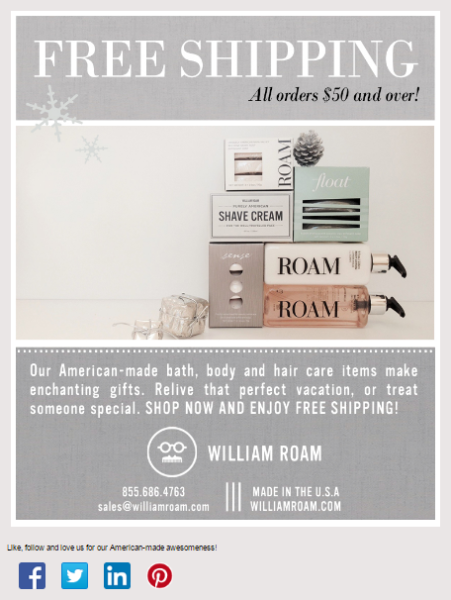 You can even set a specific price point, like William Roam, to tempt shoppers into adding an extra item or two to their cart. Have some fun with your customers this season by running a holiday photo contest, like Tasty Burger. They created a special “12 Days of Ugly Sweaters” contest to inspire customers to show off their holiday fashion and enter to win a $150 gift card. You have all the ideas you need for a great holiday promotion. Now, all you need is to put your ideas into action. Sign up for a free Constant Contact trial today to choose the perfect template and customize it for your business.